HOT FIREPol® Probe qPCR Mix Plus (Capillary) is optimized for real-time quantitative PCR assays using sequence-specific fluorogenic DNA-probe chemistries. The Mix contains all the components necessary to perform qPCR, with the exception of template, primers, and probe. The qPCR Mix contains optimized components and HOT FIREPol® DNA Polymerase supplied in a proprietary reaction buffer that enables detection of low copy number targets. HOT FIREPol® DNA Polymerase is activated by a 12 min incubation step at 95°C. This prevents extension of non-specifically annealed primers and primer-dimers formed at low temperatures during qPCR setup. 08-16-00001 1 ml 5x PDF PDF PDF 29 EUR Login to buy! 08-16-00008 8 ml 5x PDF PDF PDF 220 EUR Login to buy! 08-16-00020 20 ml 5x PDF PDF PDF 500 EUR Login to buy! 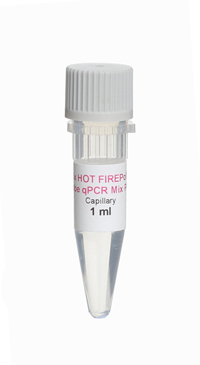 Shipping and temporary storage for up to 1 month at room temperature has no detrimental effects on the quality of HOT FIREPol® Probe qPCR Mix Plus (Capillary). LightCycler is a registered trademark of Roche Applied Sciences. Rull K, Tomberg K, Kõks S, Männik J, Möls M, Sirotkina M, Värv S, Laan M.
Zupan J, Komadina R, Marc J.
Proteome changes of human bronchial epithelial cells in response to pro-inflammatory mediator leukotriene E4 and pro-remodelling factor TGF-beta1. Altraja S, Jaama J, Altraja A.
J Proteomics. 2010 Apr 18;73(6):1230-40. Epub 2010 Feb 26. Micro RNAexpression profiles of human blood monoyte-derived dendric cells and macrophages reveal miR-511 as a putative positive regulator of TLR4. Tserel L, Runnel T, Kisand K, Pihlap M, Bakhoff L, Kolde R, PetersonH, Vilo J, Peterson P, Rebane A. Journal of Biological Chemistry. 2011 June. 286 (30).